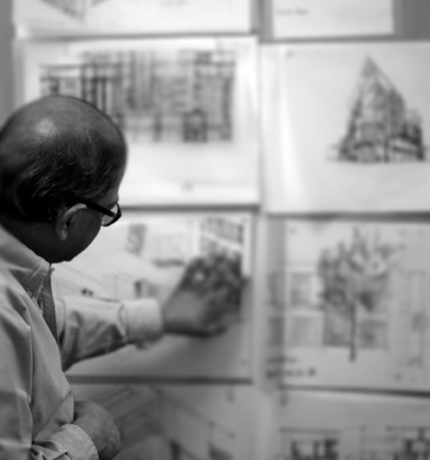 chaudhuriARCHITECTS was fifteen years old in 2018. Its Principal, Tapan (Tito) Chaudhuri has been in practice since 1976 and a partner in several firms. It is a small firm in North London which has won two awards; one for the Studio Cottage project in Esher, Surrey, and the second for its residential architecture. The projects are monitored at senior level throughout its development. The team endeavours to write as detailed a brief with the aid of the client and also foster good open relationships with the project contractors. The team members working with him have always been young recruits, and all post-graduates. Their commitment to design and architecture has been very genuine and it shows in the final product the Practice delivers to its clients. The new house at Studio Cottage and the remodelling of the apartment in Mayfair are cases in point. The Practice believes that every individual has something personal to offer, other than his or her interest in architecture. We have illustrated some of the artwork of past and present members of the Practice and Tito's monochromatic photographs. Contributors have been Anna Derbyshire, Alinda Barua, Peter Cook, Bronwen Chatwin and Maria Dumitru. Some of these hang in clients' houses personalising the architecture and continuing the bond between designer and client. We anticipate others who join the firm to bring their individualism to inform on our work. Click here to view the gallery. The images and drawings that follow are examples of the Practice's work. Each project is very individual and worked out with the client, enabling a sense of personal taste within a canvas fashioned by the architects.